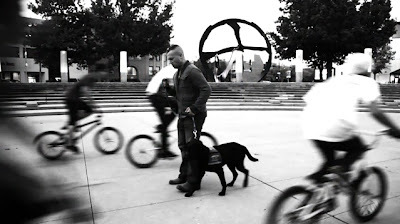 Paws & Effect, a Des Moines, Iowa-based non-profit organization that raises and trains service dogs for Iowa combat veterans, recently launched an award-winning series of four television Public Service Announcements (PSA). Some of the actors featured in the PSAs are actually Iowa National Guard soldiers and airmen, both male and female. The “We Serve with Honor” Public Service Announcement (PSA) campaign depicts how service dogs help veterans diagnosed with Post-Traumatic Stress Disorder (PTSD) negotiate physical and emotional hazards, at home and in public. Copies of these 15- to 30-second television spots are available to media outlets. Gently nudging an individual to interrupt flashbacks. Keeping others at comfortable distances. Checking around corners, and guiding through crowds. According to the organization, handlers of psychiatric service dogs--and service-dogs-in-training--are granted access rights in the state of Iowa identical to that of handlers of seeing-eye dogs, which enjoy a longer history of recognition and acceptance by the public. The campaign recently won a Gold “ADDY” from the Des Moines Chapter of the American Advertising Federation (AAF) in the Public Service category, and a Silver “ADDY” in a four-state district comprising Iowa, Kansas, Nebraska, and Missouri AAF chapters. The campaign has advanced to national competition. Uniform manufacturers Propper International Inc., Weldon Spring, Mo. The EnAble and Valor employee resource groups of PepsiCo/Quaker Oats, Cedar Rapids, Iowa. Hy-Vee grocery store: 5750 Merle Hay Road, Johnston, Iowa. Canine Craze Performance Center, 3101 104th St. #3, Urbandale, Iowa. Off-duty soldiers and airmen of the Iowa National Guard. In addition to training service and mobility dogs, Paws & Effect provides “Pet Partners” for animal-assisted therapy and activities. It also regularly conducts agility trials as fund-raisers. Because it is a 501(c)3 organization, donations to Paw & Effect are tax-deductible. According to a Mar. 26 Army news release, members of the 2nd Brigade Combat Team (B.C.T. ), 34th Infantry "Red Bull" Division launched helicopter-based operations in the Galuch Valley of Agahanistan's Laghman Province on Friday, Mar. 25. News reports from the Des Moines (Iowa) Register and the Omaha World-Herald, each of which currently have reporter-photographer teams on the ground in Afghanistan, posted their respective coverage of the announcement here and here. Army leaders did not speculate as to the expected duration of the operation. News reports specifically mention involvement of 1st Battalion, 133rd Infantry Regiment (1-133rd Inf. ), 1st Squadron, 113th Cavalry Regiment (1-113th Cav. ), and 334th Brigade Support Battalion (334th BSB), although other "Task Force Red Bulls" soldiers can also be expected to participate. The operation involves the movement of soldiers by helicopter--what the military calls an "air assault"--to search villages for equipment used by those fighting against Afghan and coalition forces. In addition to weapons, homemade explosives, and communications equipment, soldiers are also to look for specific enemy personnel. Throughout the operation, soldiers meet with village elders to encourage cooperation against anti-Afghan forces. The plan was for Iowa and Afghan soldiers to show up at each village in force and to ask village leaders to voluntarily let the Afghan troops search buildings peacefully. But Guard leaders warned that some villages might resist. “You need to go into there with the mentality that you’re going into a fight. If you think any differently, you’re fooling yourself,” Major Aaron Baugher of Ankeny said during a briefing of officers and senior sergeants before the operation kicked off. Despite the fact that Army leaders themselves announced the operation shortly after its launch, friends and family in Iowa expressed mixed reactions regarding the publication of the news. Some worried that even general information would place loved ones at risk--the result of what the military calls a violation of "operations security" ("OPSEC"). Others said they were worried about their soldiers, but were proud of their mission and service. Just so you know, articles like these make it IMPOSSIBLE to sleep when you are the wife at home with the kids. This is hard enough, thank you for adding to it. Hard enough laying my head on a pillow knowing that at the same time he is putting a helmet on & heading out. It is one thing to be informative, it is another to try to sell a story with total disregard to how it may affect people. There was a time when combat zones were no place for reporters ... and it should have stayed that way. I guess I have mixed feelings about this. During the Vietnam assault my parents, brother, and I sat on the couch every evening watching for a glimpse of my brother's Marine unit. Dreading it and longing for it at the same time. With today's instant news sources ... it's scary to read my daughter is participating in this assault ... but it narrows the playing field and allows me to focus on just those news items that might apply to her situation. I can't control the events ... but I can sure pray more specifically for the teams involved! God bless the warriors and their loved ones back home. I am so proud of all of these soldiers! They are doing what they have been trained for! My husband would much rather be doing "something" as apposed to sitting around doing nothing while he is deployed. I don't think it's fair to blame the reporters for our fears as army wives war is war and it would be silly of us all to expect it to be all sunshine over there while our husbands and wives are over there. Although I understand the stress that comes from having a spouse gone and a part of a war, don't miss the part of the story where our soldiers are helping these people so much! They are going in and possible saving many lives because of these missions! Thank you all! Your truly amazing and I believe God's angels will protect you all! When training soldiers to assault an objective--a house or village, for example--military trainers often stress the importance of surprise and secrecy. Soldiers sneak around, and communicate quietly using hand-and-arm signals. Once the helicopters and bullets start to fly, however, the trainers just as often have to remind mute soldiers that it's OK to start communicating out loud, even if it means shouting over the noise. "Talk to one another!" they say. "The enemy already knows you're here!" A couple of weeks ago, Household-6 and I decided to go shopping for a new car. By coincidence, an Army buddy happened to walk into the same dealership at the same time. My wife and I ended up buying a car that day. Our randomly selected salesperson was helpful, courteous, and observant. My buddy wasn't as lucky. Household-6 and I had walked in cold, and taken our chances as to what kind of Sales Guy might be walking the dealership floor. My buddy, as we were to later learn throughout an excruciating afternoon, seemed to have made multiple mistakes: He called ahead, he let a salesperson know what the make and model in which he was interested, and asked "his" Sales Guy (let's call him "Sales Guy II") to prepare some facts and figures prior to his arrival. Sales Guy II didn't do his homework. Like most citizen-soldiers, my buddy is a straight-shooter. He was disappointed that Sales Guy II hadn't prepared for their discussion. He ended up walking out. Later on that afternoon, he called Sales Guy II to discuss the matter further. He ended up talking to Sales Guy II's manager. Call him "Sales Boss Guy." I know this, because my spouse and I were still at the dealership when he called. Note to Sales Guys and Managers everywhere: Your cubes do not have doors. Other customers can hear you. We can hear you making fun of soldiers and veterans, puffing up like it was a post-game locker room mating dance, after you get off the phone. "Sure you're a soldier--I've got the bullet holes to prove it!" We can hear you tell your potential customers: "The customer is not always right. That's what I tell my sales people." These conversations went on for more than an hour. The only thing that kept us in our seats was that "our" Sales Guy was helpful, courteous, and observant. I've worked in sales a little myself, and I know it's a tough gig. I wasn't going to take bread off one guy's table just because his boss and co-workers are louts. I got to meet that boss when I inquired as to the dealer's advertised $500 discount for military personnel. Sales Boss Guy wanted to put his grubby mitts on my military ID, to "make sure it was real." He was the same guy who told my buddy that the customer isn't always right. I called my buddy and told him what we'd overheard, and that he should probably take his business elsewhere. He ended up going to a different dealership just down the road. In retrospect, maybe I should've done the same. During a previous purchase of a new American-made car, Household-6 and I thought the whole experience was somewhat hokey. We'd purchased a Saturn, back when that company was still in business. When we went to pick it up, our new car was ready and waiting for us, positioned in a room labelled as a "launch pad." The staff stood by to deliver applause, if we so desired. It was cheesy and a little goofy, but it worked. From the start, we felt great about our purchase. This time, we find the whole car-purchase process devoid of joy. We're still buying American, but we're given little reason to celebrate it. Because we had to special-order our new vehicle, we wait six weeks for delivery of our new vehicle. We get pushed off to a rainy Friday afternoon. Household-6 and I each take a half-day off work to complete the transaction. After we arrive at the dealership, we are herded into a "customer lounge," one so crowded and hot that we could do nothing but stand and wait. We are waiting on Finance Guy. While we wait, Household-6 points to the shadow box display hanging on the wall next to where we're standing. It's a folded American flag, with a "Red Bull" certificate stating that it had been flown by Task Force 168 during its 2004-05 deployment to Afghanistan. It's a thank-you to the dealership for their patriotic support. Sure they're patriots. They've got the bullet holes to prove it, don't they? After we're finally stuffed into Finance Guy's little office, he suddenly balks at taking a loan check from USAA. (I mention USAA by name here, because it's an insurance and finance company with origins in the U.S. armed forces.) He says it's the dealership's policy "not to release a vehicle until a loan-check clears the next business day." It is Friday afternoon. I have taken a half-day of work off, and so has my wife. Now, he wants me to come back tomorrow. I could write a personal check, and Finance Guy would apparently take it with no question--but he's got problems with a USAA check?! I calmly tell him to talk to his boss, to ask for a waiver to the alleged policy. He tells me that demanding things is no way to get things done. I begin to take offense. He takes offense. Among other things, he complains that I have requested the dealership's logo not be affixed in any way to our new car. I tell him that, given his dealership's earlier attitude toward citizen-soldiers, his organization is on probation with me. I imply that I might be doing him a favor in not having his business logo on my car. From zero to 60 seconds, he weaves and speeds from "there are a few bad apples in every organization" to "I'll personally stomp anyone here who says bad things about soldiers" to "See this tie-tack? It's a National Rifle Association emblem. I'm a patriot." He ends up leaving his office for a few minutes, allegedly to talk to a boss. After he returns, my wife and I buy a new car. Right before we sign the papers, Household-6 asks about that $500 military discount we were promised by Sales Boss Guy. Finance Guy calls and checks. "I saw the photocopy of your military ID in your folder, but I didn't know what it was there for." The discount had never been applied to the purchase price. What my wife and I don't tell Finance Guy? That Mr. "The Customer is Not Always Right" Sales Boss was also the same person who, after our first visit, appeared on our television doing a car commercial. According to the commercial, "Sales Boss Guy" is actually the dealership's General Manager. A few bad apples, indeed. In a military unit, the Head Apple is responsible for everything his or her organization does and fails to do. That goes for maneuvering, supporting, and provisioning troops in combat, and that goes for training them to be effective and professional in their jobs. The latter includes unsexy tasks such as eliminating discriminatory practices and attitudes within the ranks. I'm quite pleased with our new car, and not at all pleased with the attitudes we encountered during its purchase. This particular dealership has reportedly spent thousands of dollars to provide teddy bears to the children of deployed Iowa National Guard soldiers. I'd be happier if, in the future, they spent a little money and attention on customer service and diversity training for their management, sales, and support staffs. Put your mouth where your money is. During his children's sermon earlier this week, our pastor asked those present to name those places in the world that seem to need an extra portion of God's love. Each time someone called out a location--adults were encouraged to participate, too--he'd place a pink construction-paper heart on a world map held between two acolytes. I'm all about crowdsourcing the word of God, but I couldn't help notice two places apparently no longer on our radar of good intentions: Afghanistan and Iraq. Maybe it's war fatigue. Maybe it's a political climate, here in the homeland, that encourages demonization over democracy. Maybe it's a national media that's too easily distracted by squirrels. Maybe it's the fact that so few U.S. citizens seem to be or know people in uniform. Whatever the reasons, good people sleeping peaceably in their beds at night are glazing over the so-called Global War on Terror. Even the ones that are paying attention might be in danger of getting the wrong idea. Take, for example, the current deployment of the Iowa National Guard's 2nd Brigade Combat Team (B.C.T. ), 34th Infantry "Red Bull" Division to Afghanistan. There are roughly 3,000 citizen-soldiers on the deployment, and each have their own stories. Some directly engage both friends and enemies on a regular basis. Others might spend most of their year-long deployments "safely" behind the walls of a friendly military base. Arguments over who's got it worse or who's more important miss an important target: Every soldier serves. Every soldier misses out on a year or more of life at home. Every soldier is daily sacrificing something by walking in those boots. There are also 3,000 different stories told to friends and family. Some buddies of mine, for example, won't tell their spouses if and when they've gone "outside the wire"--left the relative safety of a military fortification. What they don't know won't hurt 'em, they say, and if the wife thinks I'm safely behind a desk, everybody's a winner. Other friends, on the other hand, go out of their ways to talk about being at the "tip of the spear." I've recently heard from other Red Bull friends both downrange and here at home, frustrated with the apparent lack of understanding that an Army deployment isn't all puppies and candy. "I think it is that they want to be informed but they don't want to hear bad stuff," one Red Bull recently wrote via Facebook. "It's like our families think that we just sit around, relax, and just enjoy the air. Every time I talk to anyone back home they act like this is some sort of vacation for me." To their respective organizations' credits, recent reports from Midwestern newspapers have begun to crack potential mis-conceptions here at home, offering people a clearer-eyed and closer view of a conflict otherwise too easily forgotten. An Omaha World-Herald team, for example, recently encountered a couple of concrete reminders of how soldiers live daily at risk. First, there were the blast-marked walls of a Combat Outpost ("COP"). Then, there was a padlock on the "Morale, Welfare, and Recreation" Internet café. A Des Moines (Iowa) Register team recently noted the effects of an Improved Explosive Device (I.E.D.) 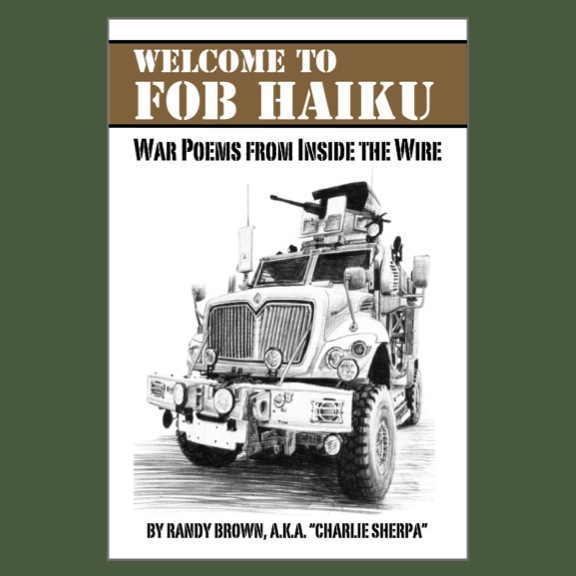 attack on a Mine-Resistant Ambush-Protected (MRAP, "em-rap") vehicle. It's not a vacation. It's a war of some sort, conducted on our behalf. Pay attention. And pray for an extra portion of providence. 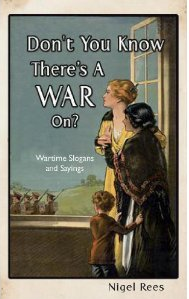 Image used in this post: Cover of "Don't You Know There's a War On: Wartime Slogans and Sayings" by Nigel Rees, to be published July 2011. Despite yesterday's Red Bull Rising blog post, the Omaha World-Herald isn't the only newspaper with a team in Red Bull territory. This week, the Des Moines (Iowa) Register's writer Tony Leys and photographer Rodney White have reportedly arrived in Afghanistan's Paktiya Province, where they'll begin their on-the-ground coverage of the 2nd Brigade Combat Team (B.C.T. ), 34th Infantry "Red Bull" Division (2-34th BCT) troops deployed there since November 2010. The Register's "Iowa National Guard" blog has long appeared in the Red Bull Rising blog-roll, at right. Leys and White will continue to update the blog with snapshots of soldierly life, duty, and downtime downrange. There's an improved graphic interface featuring the newspaper's past and present coverage of the deployment here. Readers can also follow some of the newspaper's deployment coverage via Facebook here. Paktiya Province is the area of operation for 1st Battalion, 168th Infantry Regiment (1-168th Inf. ), headquartered in Council Bluffs. 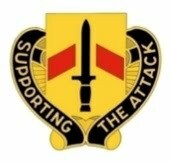 Unlike other 2-34th BCT units, which are operating at "Task Force Red Bulls" in Parwan, Panjshir, Laghman, and other contiguous provinces, the Council Bluffs unit falls under Task Force Duke, an active-duty organization centered on the guidon of 3rd BCT, 1st Infantry Division (3-1st BCT), of Fort Knox, Kent. Previously in the Iowa National Guard deployment, 1-168th Inf. answered to the 3rd BCT, 101st Airborne Division's (3-101st BCT) Task Force Rakkasan. However, several soldiers said they don’t want folks back home to get an exaggerated impression of the violence they face. Armored trucks have hit roadside bombs, and Iowa platoons have been in a few firefights. “But it’s not like we’re storming the beaches of Normandy every day,” said Spec. Josh Gottschalk, a medic from Minden. The Omaha World-Herald recently launched a blog titled "At War, At Home," which covers Nebraska and Iowa citizen-soldiers currently deployed to Afghanistan. The blog now appears in the Red Bull Rising blog-roll, at right. Reporter Joseph Morton and photographer Alyssa Schukar are currently embedded with 2nd Brigade Combat Team, 34th Infantry "Red Bull" Division (2-34th BCT) units downrange--the deployment includes the Nebraska National Guard's 1st Squadron, 134th Cavalry Regiment (1-134th Cav.) --while reporter Matthew Hansen and editor Cate Folsom are covering the home front. Read more about the blog team's background here. 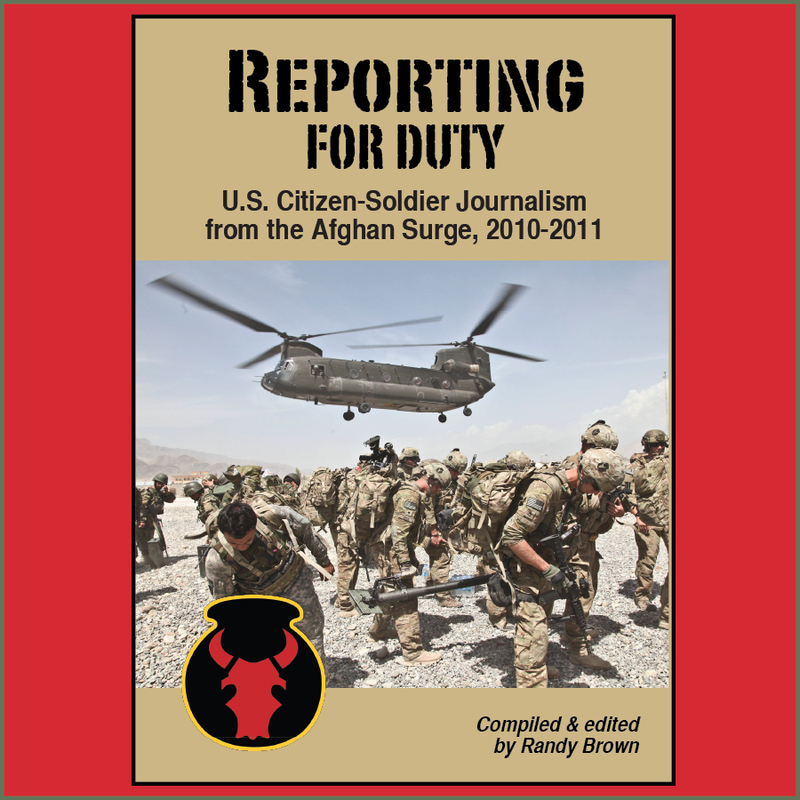 In October 2010, Morton and Schukar also covered the units' pre-deployment training at the National Training Center, Fort Irwin, Calif. Click here for more details of that coverage. The new Omaha World-Herald blog regularly presents eye-catching news photos and portraiture, environmental videos, and question-and-answer sessions with individual soldiers. The editors also promise to regularly post "round-ups" of the newspaper's coverage, to help readers ensure they haven't missed anything. For two such round-ups click here and here. "Nebraska troops deliver food," (Mar. 3). A 1-134th Cav. humanitarian-assistance mission delivers food to Afghan families. "Neb. troops make a difference" (Mar. 4). Kabul's police chief is thankful for the assistance of Nebraska National Guard soldiers and trainers, but thinks U.S. presence will still be required for another five to 10 years. "Mealtime in Afghanistan" (Mar. 5). How soldiers of Bravo Troop, 1-134th Cav. dine on local delicacies. "Troops coax out rural cops" (Mar. 7). How Alpha Troop, 1-134th Cav. uses humanitarian-assistance missions such as "Operation United Front" to bolster Afghan police image and presence. "A smokin' oasis for soldiers" (Mar. 12). Cigar-scented "Tiki Hut" hang-outs at Camps Phoenix and Dubs, Afghanistan, serve as places where Nebraska soldiers can blow off steam ... and smoke. "Working their way back" (Mar. 13). Veterans groups and other organizations are preparing to assist National Guard members find new employment after they return home from deployment. "Marathon man: Gretna Guard member plans to run the 26.2-mile Lincoln race in Kabul" (Mar. 14). Deployed to Camp Phoenix, Afghanistan, Army Maj. Spencer Giles continues to work toward his goal of making the "Lucky 13" club, which is made up of people who have run the Lincoln, Neb. marathon 13 times. "Guardsmen's job: Policing the police," a Mar. 15 article describing how Nebraskans daily train Afghan law enforcement personnel, while suspecting that some locals--both police and civilian--may be less than honest. 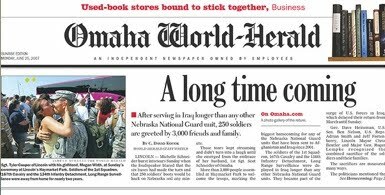 Here's a friendly reminder: If you find local and regional news coverage of Nebraska and Iowa citizen-soldiers meaningful, compelling, or useful, please be sure to buy some newspapers; make positive reader comments on newspaper and television station blogs; or send editors, reporters, and producers words of thanks via postal mail. If you stare at something long enough, sometimes you start to see patterns. Driving for hours on the Midwestern flatlands, cornfields blurring past, mind wandering but present, the trick is to recognize when you're making real connections, and when you're just making crop circles. Earlier this week, I had the opportunity to travel to downstate Illinois. In a series of coincidences, similar to those I encountered in Mississippi last year, I repeatedly came across the number "33" and the symbol of a Golden Cross--in museums, in roadside signs, and even on bumper stickers. The 33rd Infantry Division was created in the same pre-World War I years as the 34th Infantry "Red Bull" Division. Where the Red Bull was originally comprised of soldiers from Iowa, Minnesota, and North and South Dakota, however, the 33rd Infantry Division was made up of soldiers from Illinois. 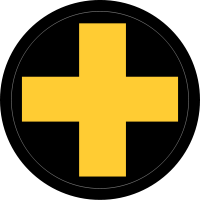 The division patch is a golden cross, superimposed on a circular field of black. The symbol's origin stems from an Illinois regiment's pre-WWI practice of marking property with a yellow cross as protection from thievery, based on the belief that the color and shape was anathema to Muslims. The 33rd Infantry Division fought in Europe in World War I, and in the Pacific in World War II. In other words, the 33rd IBCT and the U.S. National Guard was technically responsible for the primary vector toward U.S. military success in Afghanistan: The training of a professional and capable indigenous national security force. During my recent Illinois travels, a museum exhibit mentioned the American Civil War-era 33rd Illinois Volunteer Infantry Regiment. The states-and-numbers system used in the naming of military units was chewed up and spat out during that war, but somehow the state of Illinois held on to the number 33 during the early 20th century reorganization of the U.S. National Guard. I have yet to connect the official unit genealogy--the "unit lineage"--between the Civil War-era 33rd Illinois Volunteer Regiment and the modern-day 33rd IBCT. The numerical similarity, however, caused me to ponder a sequence of U.S. National Guard divisions created in the years prior to World War I. Was there a reason that the Illinois unit was designated "33"? Was there a reason that the "Red Bull" was numbered "34"? Were there other connections to be made? The 32nd Infantry "Red Arrow" Division came from Wisconsin. The 33rd Infantry "Prairie" Division came from Illinois. The 34th Infantry "Sandstorm" (later, in World War II, designated the "Red Bull") Division came from Minnesota, Iowa, and the Dakotas. The 35th Infantry "Santa Fe" Division came from Kansas, Missouri, and Nebraska. The 36th Infantry "Arrowhead" Division came from Texas. The 37th Infantry "Buckeye" Division came from Ohio. The 38th Infantry "Cyclone" Division came from Indiana, Kentucky, and West Virginia. Obviously, the 36th Infantry's "Arrowhead" is the outlier, the only non-Midwestern state in the sequence. In terms of geographic adjacencies, the shapes of unit patches, the nicknames of the units, the possible patterns seem neither random nor entirely rational. For example: The unit patches of the 33rd, the 35th, and the 37th divisions, for example, are all circular. Those of the 32nd, 36th, and 38th are varying types of triangles. The 34th, 35th, and 38th were all originally named regarding significant weather or terrain of their respective World War I training sites. It's all fun to think about, but I'm not sure it gets me anywhere. Look at something long enough, and you start to see things. Sometimes, there are patterns to be found, even out on the prairie. Other times, you seem to travel in circles. Finding where you started, however, doesn't necessarily mean you've ended up in the same place. In many units, soldiers sound off with a variation of their organization's motto when saluting each other. Currently in the 2nd Brigade Combat Team (B.C.T. 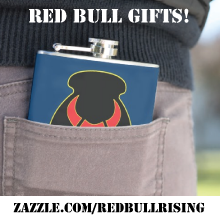 ), 34th Infantry "Red Bull" Division (2-34th BCT), the standard salutation is, "Red Bulls!" The person returning the salute replies with "Attack!" --an echo of the 34th Infantry Division motto, which is "Attack! Attack! Attack!" The 2-34th BCT command sergeant major says that it's "Red Bulls," because the unit is a team. "'Red Bull' is an energy drink," he says. "Red Bull ..." / "and vodka!" "Red Bull ... / "and Jaegermeister!" In keeping with Iowa's agricultural roots, a buddy of mine has perfected replying with an "Attack!" that sounds as if it were spoken by some sort of mutant chicken. When, I'm not snickering like a school boy at his antics, I've come to regard his "attack / chicken" combo as a potential comment on the duality of man, sort of like simultaneously wearing a peace symbol on your body armor and writing "Born to Kill" on your steel pot helmet. Such pranks within the ranks extend to battalion-level mottoes, as well. During the 2-34th BCT's Fall 2010 rotation at National Training Center, Fort Irwin, Calif., for example, members of the 334th Brigade Support Battalion were known to reverse the order of their unit's sound-off: "Support the attack" became "attack the support. It seemed to be an inside joke among logisticians, a collective comment on their combative customers. As one canny Red Bull Rising commenter has already noted, some unit mottoes lend themselves more to creative mis-interpretations than others. 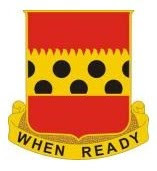 The "when ready" motto of the 2-34th BCT's 194th Field Artillery, according to a couple of Red Bull red legs, is occasionally delivered as "when (you're) ready" or "when (we're good and) ready." Symbolism: The colors scarlet and yellow are for Artillery. The flame-like partition line indicates the intense fire power of the organization’s artillery. The pellets depict cannon balls and symbolize readiness. Symbolism: The colors are from the Iowa Army National Guard shoulder sleeve insignia. The wall fortifications signify the assimilation of the 834th Engineer Company into the Battalion. 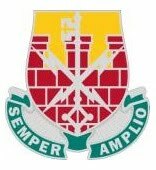 The crossed lightning flashes are a reference to the Battalion’s history as the 234th Signal Battalion. The key refers to opening the way to improvement. The teal color of the scroll is for units unassigned to a branch. Symbolism: Buff and scarlet are the colors traditionally associated with support units. The bayonet recalls the battalion's association with the 34th Infantry Division and the 54th Infantry Regiment. The battalion's motto is underscored by the sections of the chevron supporting the upraised bayonet; together they highlight the unit's "forward" mission. Red stands for sacrifice. Black represents strength. For more information on other 2-34th BCT unit insignia, see part 1 and part 2 of this series. For a review of the units currently comprising the 2-34th BCT, click here.